Double Fine wasn't necessarily out to create a Sesame Street game, things just ended up that way. The reveal of Double Fine's newest project, Sesame Street: Once Upon a Monster, was a big surprise. The studio isn't known for licensed titles, and I don't think anyone expected a Sesame Street game to land at its doorstep. In an interview with Gamasutra, Double Fine's Tim Schafer and the game's project lead Nathan Martz reveal how the collaboration occurred. While developing Brutal Legend, Double Fine split into four teams to create prototypes for new game ideas. Schafer says Martz's involved "cute, furry little monsters, making music and having fun," a perfect fit for the Sesame Street license. Double Fine kept working on it over three-and-a-half years, and eventually added Kinect functionality. When Warner Bros. announced that it had acquired the Sesame Street license for videogames, it was perfect timing, and Double Fine was able to hammer out a deal. As explained by Schafer and Martz, the Sesame Workshop and Double Fine make a great team due to the "secret" humor of Sesame Street. Schafer says: "You watch the videos of the [Sesame Street] shows, and they're really, really funny. They're satirical -- they don't just make bland shows for kids, they make them actually funny." Double Fine wants parents and kids to play and enjoy Once Upon a Monster together, just like they would watch the show which has references and content designed for both. Martz calls the game a "force for good," also like the show, and hopes it'll prove that quality games don't all have to be about violent space marines. Schafer adds that it can "still be funny" too. 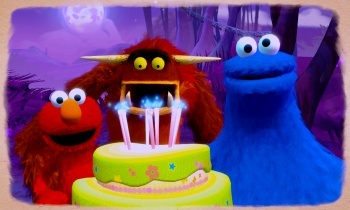 Sesame Street: Once Upon a Monster is planned for release in fall 2011.